Dogblog is a blog about Couscous. She is a standard, brindle, wire-haired dachshund, born October 2009 in Wiltshire, UK. She is the pup of Sunsong Vanilla Ice (sire) and Boloria Anastasia (dam). Her favourite pastimes include sleeping, taking slow walks around the block, visiting our neighbour Cecilie, having her belly rubbed, chasing trains, rolling in sand and nudging my leg for extra treats. 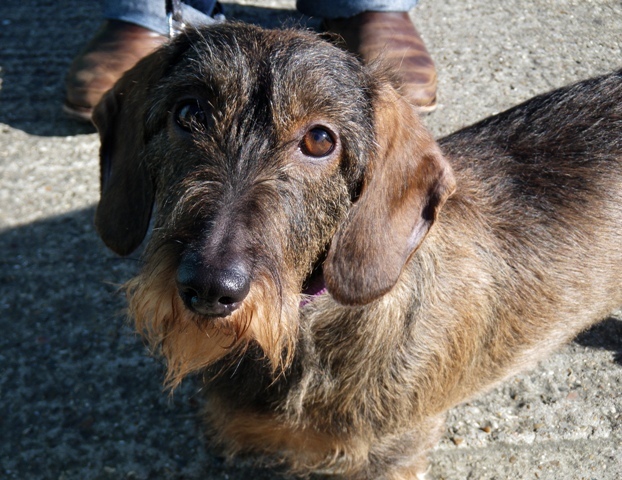 This blog highlights many of the places we take her on weekends and a few news items relevant to dachshunds (but sometimes just dogs in general). Not unlike a cheeky mogg. Would be hiding like that mogg? Would then get his own dog blog!